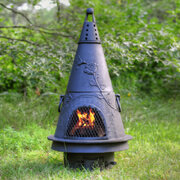 Call it what you want, a garden chiminea or "the one shaped like a witches hat". 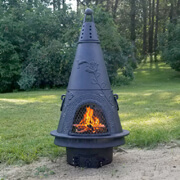 The Garden chiminea is a unique chiminea. 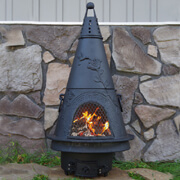 The hummingbird and rose design reflects a garden setting and the mouth is accentuated by a Aztec southeast design. 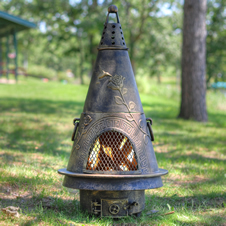 The top is a permanent cap to keep out the rain and the main body separates to expose a hibachi type grill. 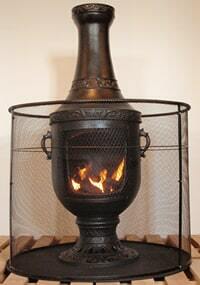 Choose from low maintenance cast aluminum, cast iron, or instant starting cast aluminum gas models below.